A wonderful exhibition of nature photographs by leading amateur photographer and longtime resident of Newstead, Alan Jesse Hartup (1915 –2004) will be opened at the Newstead Railways Arts Hub on Saturday October 10th at 3pm. 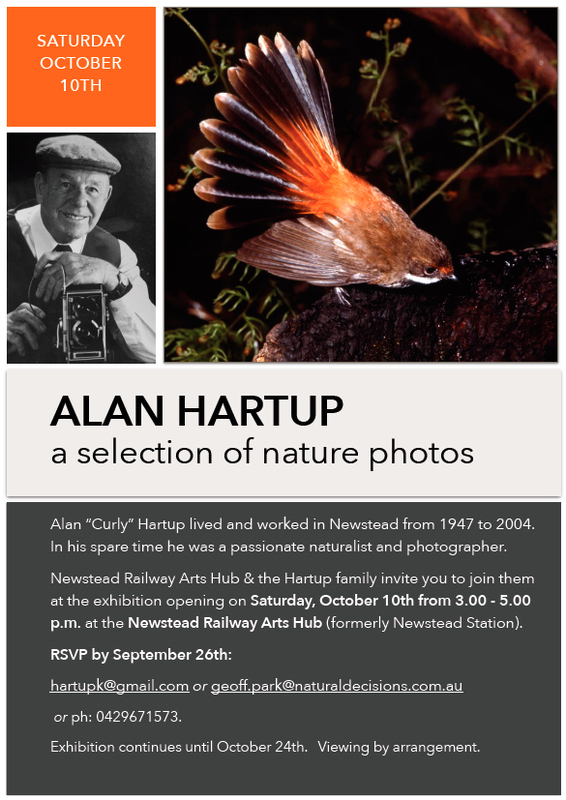 This exhibition is largely of bird life in Newstead and the surrounding districts, from Alan’s vast array of black and white photographs and colour slides. This selection of 20 works of black and white and prints from colour slides, span over 60 years of Alan’s impressive output. Beginning with his beloved 35m Voigtlander camera, he progressed to the brilliant level of work he achieved with his Mamiya and Rollieflex 2¼ square cameras and his great ability with dark room techniques. Alan has been represented widely in amateur circles and has been a central figure in promoting, selecting and judging photography in Victoria and interstate. In preparing for this exhibition we have been reminded what a wonderful legacy Alan has left with images of the beauty and richness of our surroundings. He was a man at one with the natural world and one who took a vital interest in our environment and how to care for it. The exhibition was prompted by local field naturalists Geoff Park and Mrs. Joan Butler. We, members of Alan and Rita’s family, appreciate the opportunity to show his work.